CPR, or (Cardiopulmonary resuscitation) is a hands-on practice that is intended to keep a victim alive by physically pumping blood that has been oxygenated into the body’s organs and oxygen into the lungs while waiting for arrival of medical help. An individual having a CPR Certification and can able to begin CPR in advance, and prove to be the big difference between surviving a heart incident and not surviving one. Gaining a CPR certification can be extremely valuable for many reasons- sometimes it’s a job requirement for healthcare professionals as well as non-healthcare workers. It’s also very valuable from a personal preparedness standpoint- being able to respond adequately in an emergency situation. Breathing and Compression training- a CPR course will teach the breathing and compression techniques for adults, children and infants alike. First Aid and Bloodborn pathogens training- In addition to the basic CPR techniques, the CPR classes should include how to treat bruises, wounds and gashes, and how to respond quickly to situations where the victim is bleeding profusely. Real life scenarios- the instructor will likely take students through a number of real-life situations so as to be able to familiarize oneself with the proper steps for response in the event of an emergency. Knowing what to do from the first moment of the event until help arises will be a fundamental part of the course instruction and outcome. You can receive standard CPR certification and take CPR classes from certified agencies including the American Heart Association, National Safety Council, American Red Cross and other trusted CPR training agencies like USCPROnline.com. It’s important to note that most CPR certification offerings have a two-year validity and need to be renewed to stay current and certified. Many healthcare professionals are required to take CPR classes as a requirement for renewing their own professional licenses. Duration and content can vary somewhat, but the average cost for individual training is anywhere from $45-60 with materials costing $20-30 additionally. Your employer may be able to arrange for a group training session onsite to offer cost savings. Online CPR certification classes are offered, however there is an expectation that students are still obligated to meet with a CPR trainer in person to achieve final certification and demonstrate practical application of CPR techniques. 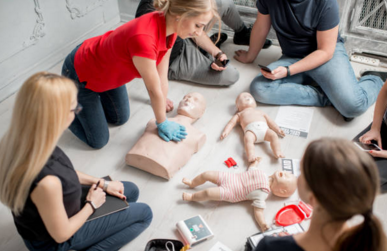 Some training offerings include “blended” CPR classes which includes a cognitive part of training online prior to a in-classroom setting to pass a skills test. To stay in line with OSHA (Occupational Safety and Health Administration) governance, companies and learning institutes can offer CPR training to their employees for preparedness in an emergency. Such costs for group training will vary, based on the requested content and materials provided. The more people attending a group training session, the higher the cost may be.